Besides “What did you say?”, another item of the grandfather lexicon is “you can learn everything you need to know about a person from their handshake.” Although my grandpa has never told me this – he uses his other senses (as long as you speak up) as his tools of perception – the handshake bit of wisdom is certainly more native to his timeline than mine. He’s the man by the way, my grandma too. A couple of years ago she told me: “I better live for at least 3 more years so that I can find out what happens in Lost”. A good handshake and eye contact though was all you used to need to signify your flight plan of flying right. But for the Generation “i”, professionalism is determined not just in your physical greeting, but in your eGreetings as well. (and we aren’t talking about Blue Mountain). The email greeting is today’s handshake. The line has to be professional, and it has to be perfect. I never thought I’d spend so much time thinking about something and end up at “Hello,”. But in sending out emails to the working world, we’ve all gone neurotic over the email greeting. 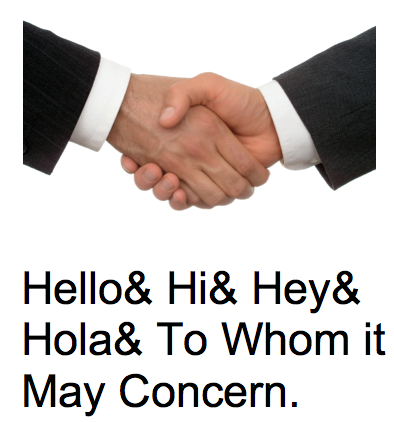 “Hi” sounds too flirtatious. “Hello” sounds spammy. “Hey” is too stoner-ish. “Greetings” is like what an alien would say. “Good afternoon” might work unless they read it in the morning. “To whom it may concern” sounds like you’re receiving a letter to let you know that an estranged great uncle of yours just died. And by the way: your email only “concerns” the recipient, in that she is “concerned” about all the resume spam cluttering up her inbox. My friend Andrew told me he always just went with “Cheers”. I was like damn, you might as well have signed off with a “Sent from my iKeg”, frat boy. There really aren’t many good options, which is one of the reasons why I start all my emails with either: “Well well well, look what we have here,” or “I’m slim shady yes I’m the real shady”. Because you have to find a way to differentiate yourself. Think about it: if you’re shaking mad hands, you’re going to remember the guy that scratches your wrist with his index finger mid-shake. I mean,,, that’s how my grandpa got his first job.